The 195,000 square-foot Boltex machining facility is located on a 35-acre site. 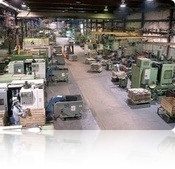 The Boltex Machining Facility houses Computer Numerical Controlled (CNC) machining equipment and robotic machining centers. It also houses one of the largest finished flange and rough forging inventories of any major domestic flange producer.